Scholars College for boys and girls Lahore Admission Open in different campus in Lahore, Rawalpindi, Multan like shadman and Alama Iqbal campuses. Scholars college for women Admissions in Fsc, Ics, I.com, F.A, BBA, Bsc, B.com, B.ed, BA, MBA, M.com, Msc, M.A, M.ed in different subjects with two and four years program offered by Scholars college for women Lahore. A project of Scholars group of colleges under the supervision of Prof Syed Khurshed Alam chairman scholars Group of colleges and university. 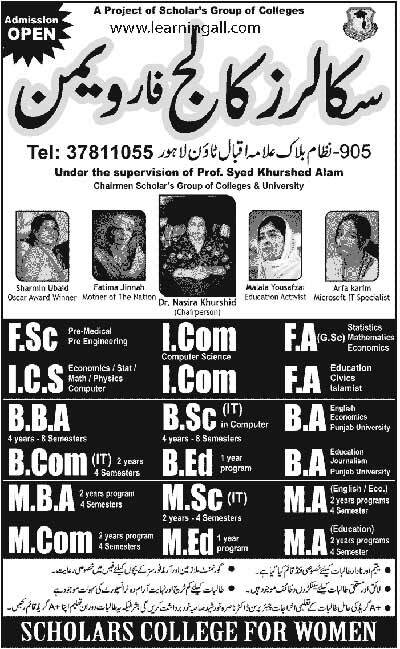 The Jang News paper advertisement dated 06 August 2017 for admissions Scholars Group of colleges in Lahore and different cities of Pakistan. Scholars College Lahore open admissions for boys and girls separate labs and library for girls. Scholars College Lahore open admissions for girls and boys separate classes for Intermediate classes, FA, FSC, ICS and I.com admission applications are inviting by College currently. College provide pick and drop facility for girls and hostel facility available indoor college campus shadman Lahore.